Finally, a sharing UI that makes sense. 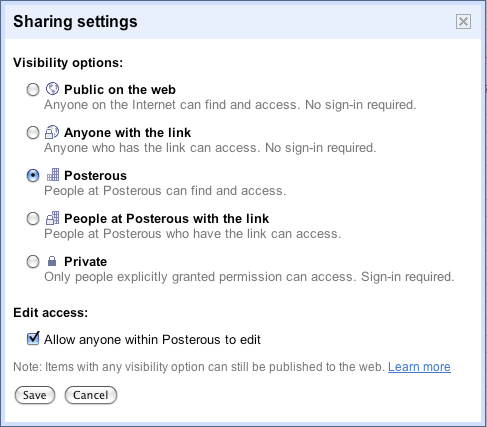 Previously, when using Google Apps for our posterous-inc.com company domain, we would *routinely* have problems where people wouldn't be able to see documents without a link because the item was 'shared with everyone' and everyone had 'access' but it didn't show up in their document list. There was a disconnect between whether it was 'in your list' and 'accessible.' Thankfully, these unnatural modes (modes are the enemy of understanding) have been removed. The Google Apps team has nailed it by making the visibility options top-of-mind. They did this by flattening the option of 'in your list' vs 'accessible' into one set of choices. They've also added visibility options prominently to the top bar. This is a good move that makes it a lot easier for people to immediately know what level of privacy they've chosen. Note also how it contextually changes and becomes more useful depending on which setting is chosen. At a glance, this turns out to be incredibly valuable. This is an example of really well done and well-thought-out UI. Kudos. Is this really available? The Google Apps integration?